"We liked the location (nearly the white, sandy beach) and th..."
Have a question for Alina Grande Hotel & Resort? "Decent balconies, air-con OK, and the swimming pool is very good." "Location is excellent, right in the centre of White Sands." "The rooms are big and the beds are comfortable." This family-run property is high on personal service and friendly staff. Located on White Sand Beach, you are on the most popular stretch of the island. Popular activities here include island hopping, elephant riding, and trekking. The tour desk can arrange for these as well as diving trips, sailing, and excursions around the island. After a day under the sun, the best way to relax is with a relaxing foot massage. Enjoy your meals at the beachfront restaurant, and as night falls, enjoy a round of drinks at the beachside bar. The family-run Alina Grande Hotel & Resort is a beachfront property worth checking out when looking for a hotel in Koh Chang. 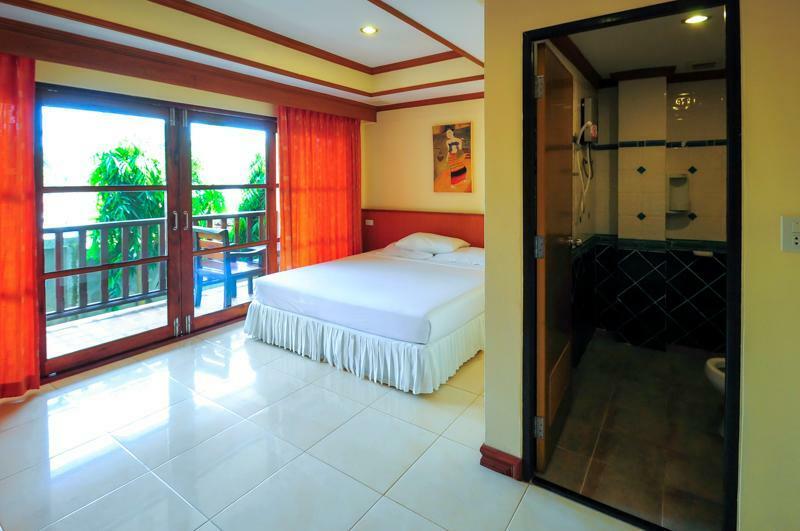 Plaza Deluxe room type is located near the Grand View Plaza and guests staying in this room type may experience some noise during their stay from the Rock Bar live music from 10:00 PM to 01:00 AM. Pool was not clean and TV was old. But the man at the reception desk was kind. White sands Beach has eroded. It's about have the width of five years ago. And a lot of trash washes up on the beach every day. You would think the staff would pick it up the trash, but they just leave it on the beach. Nice hotel with pool but could do with new decoration as looking a little tired. Helpful and friendly staff. Location is excellent, right in the centre of White Sands. Large comfortable room, a little dated but fine as we are out most of the day. Staff are very friendly and helpful. The hotel supplies towels for the pool and beach. The rooms don’t come with an electric kettle but we were supplied with one after asking at reception. The location is handy to the many restaurants, massage shops and small supermarket as well as the beach. I always stay here on motorcycle rides to Koh Chang, because they have off street and secure parking. It is an easy walk to basically all things on white sand beach, and makes for a great couple days for the price. If you are a solo travel and just want a cleanish place to sleep and keep your things (and motorcycle!) safe, this is a great place. Good location , across from the beach, right in the middle of the Main Street. Has nice swimming pool, with parking for car, Noisy bar with band playing up until 1am, so not so good if you want early nights. 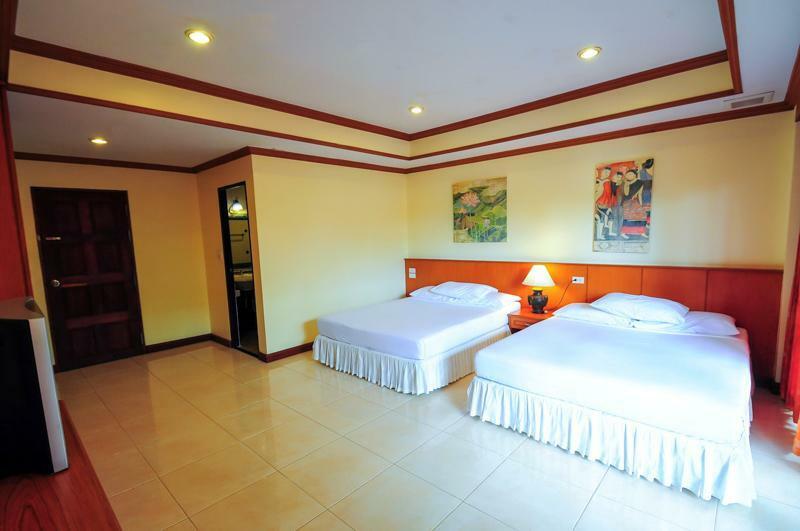 Good price for the room, convenient location, friendly staff. I've stayed at this hotel on a number of occasions and have always enjoyed my stay. There are plenty of nice places near the hotel to eat, so don't be concerned if the room doesn't come with breakfast. Note that the hotel has two locations; one (the older of the two) is on the beach side and the other (newer) is across the street from the beach. I've stayed in both locations, the rooms on the beach side are older and (in my opinion) in need of remodeling. The hotel is located near the end of White Beach (at least at high tide). Good pool, close to shops and eating areas and the beach. Have stayed there before but have noticed how the Hotel has deteriorated due to lack of maintenance.We stayed in the same room as last time.I think they could take a bit more care with repairing things. i really enjoyed my stay here. the hotel is located directly across the street from the beach, and very close to many excellent restaurants and bars. there are also many motorbike rental shops near by, which are a must if you want to go anywhere further than the beach. the only thing i did not like was the lack of free wifi. I stayed at the seaside of the Hotel, and can only recommend it. The room was basic but clean and all amenities you needs are available. It also had a nice balcony. The staff was helpful and friendly. They also rent out motorbikes, however you can get them cheaper just next door at the internet cafe. Very recommendable is the restaurant right on the beach; even though it is a little pricey for Koh Chang. I booked a deluxe room at this hotel and found that it was definitely not 3 stars (or deluxe). Basic amenities, such as shower gel and shampoo were not available. The room was very basic, although the size was ok. It appeared that they only cleaned the room if you specifically asked for it. The sogn for that was buried under a stack of other things, so I only foud this out after I cam back late afternoon. I'd say that there are much better hotels in White Sand. Very good value for money hotel with only a 30m walk to the beach. Centrally located on the main beach shopping strip on Ko Chang. Friendly staff and reasonably sized room for the price. Great reastaurants and bars within easy walking distance. My wife (Thai) and I have visited Koh Chang many times and have stayed at numerous times at this hotel. Do realize that the hotel has two locations; Alina Grande Resort on the beach side and the Alina Grande Hotel across the street. We've stayed at both; however, this write up is for the Resort on the beach side. The Resort is older and does look like it's in need of some modernization; particularly the bathroom. With that said, the wife and I really enjoy staying here; rooms are clean, service is friendly and good, and it's an easy walk to a number of great places to eat. Our room faced the beach and we throughly enjoyed sitting on the patio having a drink and something to eat. As always, we've never had any problems using Agoda or having a hotel/guesthouse accept an Agoda voucher. alina grande hotel is situated close to whitesand beach( just cross the main road) and has nice and friendly staff.rooms have greatcomfort and nice terrace.close to the hotel you cand find different good restaurants can eat very well for little money).also can book trips all over the island almost everywhere.one little thing to improve maybe : you must ask reception every day if you want your room cleaned. we managed to travel from siem reap to koh chang in the day so needed a cheap overnight stay in whitesands beach. what a good choice ! friendly welcome and good large room. breakfast was extra but good. pool and sunbeds looked new and great. would have liked to stay longer. not on the beach but only 30 yds away. one disadvantage is that the sea comes right up so that walking along the beach is limited but walk along the strip 100 yds further north and you can find the main beach. plenty of eating places and bars so good location. This is a lovely hotel with 2 sections, the less expensive faces the Klong and is more interesting. The newer section is more expensive and has a pool. The staff is helpful and friendly. It is near the action on Khao San Rd but in the middle of the noise and chaos. nice size rooms, lovely cleaners although i did feel a little sorry for them as a couple of them was very young children! great location on the beach, my taxi from the pier on the mainland consisted of a speedboat that dropped me off right in front of the hotel and have to step into the sea which i thought was great...different but wear shorts and flipflops! the busboys will help with any luggage though. i would also advise to travel different parts of the island (wont take long) as there are some lovely beaches around. shop around for breakfast aswell. alina is alwhayse nice to stay 2 i been here so many times. greate location nice staf big nice room they alwhayse keep good service.sadly new elemnts come arounde alina we dide get room to night life area thats not nice if u not like night life. loude music to 3 am evry day sad four alina hope thay solve this. 150 bath per day four internet is not 2012 should be free and not cleaned room ewry day if u not tell them mm.breakfast is not the best but in the end alina is whery nice stay in koh chang.